Economic Daily News report The following iPhone of Apple is an outlook that a Chinese enterprise newly joins the supply chain in the earphone code and the battery. Apple that makes efforts to the development of Chinese market increases the part adoption of a Chinese manufacturer whenever a new model is put out, and is straining a Taiwanese industry. As for next generation iPhone, mass production is expected to be enlargement of the product announcement after September to 4.7 inches in July. 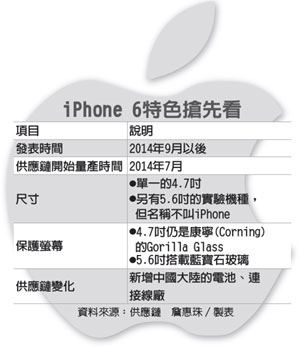 According to the supply chain stakeholders, Foxlink traditional Hon Hai / Foxconn Technology Group under the umbrella had been fed exclusively connector of the iPhone, LUXSHARE-ICT City Shenzhen Guangdong, China is applied to the suppliers in iPhone5 . Chinese Biel Crystal supplies the sapphire glass used for the cover of the camera lens, a home button of the fingerprint authentication function deployment from iPhone5, iPhone5s. When the earphone code and the battery are procured from a Chinese parts supplier, it seems to become a threat for Foxlink and Simplo Technology. As usual Kokai seems to take charge of assembly. Because Corning prepares the cover glass of 4.7 inches, it is certain that the next generation model enlarges from four inches of iPhone5s according to the supply chain affiliate. It is thought simulataneous sale plan with a description of product besides this different from iPhone as a smart phone of 5.6 inches is experimental. 5.6-inch model seems to differentiate, and to use the sapphire glass for the display with iPhone. If advanced U.S. GT Advanced Technologies that supplies it for Apple is five-inch display recently, the rationale includes the purchase of the sapphire ingot production unit that 100〜200million pieces can produce. Apple talked because the superintendence of the sapphire vendor was not in time for the 3rd quarter announcement of next generation iPhone only by pre-existing sapphire production capacity of the entire industry that the sapphire glass was preceding adopted for another large-scale model and wearable device "iWatch" (mounting type terminal).